The Pure Source Vein Stop product is said to be quite the treatment when it comes to Varicose and Spider Veins conditions. its aim is to increase the circulation of blood throughout the body while forming healthy veins. It has the properties of doing away with Spider and Varicose veins which are caused by stress over a long period of time. Some of these stress factors that lead to the weakening of the veins are being overweight and overexertion of the body. Women who get pregnant also tend to get Spider and Varicose Veins. Hereditary genes are also factors in getting this unsightly veins. It is unfortunate that people ignore these conditions when they get them for long periods of time, before seeking professional help. When they finally do, other complications may have occurred due to the neglect; namely ulcers in the legs and bleeding. At this point, the only choice is to have surgery to correct these kind of veins. It is recommended by the manufacturer that Pure Source Vein Stop should be applied on the affected area liberally twice a day. When the individual starts to see a change or results in the area, then they should go on using the product once a day. It is also recommended that you apply the product on the affected area after you have had a bath or a shower. 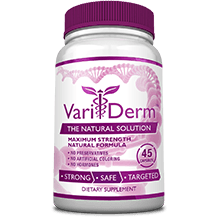 it has not been indicated anywhere on the internet by the manufacturer about what kind of side effects to look for while using this product. There are over fifteen ingredients in Pure Source Vein Stop. Going over the names, ,most of these ingredients are not even natural. It is concerning that there is not even one possible side effect for this product. As you would with any other medication, please consult with your doctor before you start to take this product. 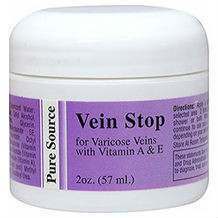 There are various prices for the Pure Source Vein Stop all over the internet. The most consistent price available for this product is fifteen dollars and thirty nine cents for three containers. These containers come packaged in 2 oz measurements. There are no specifications about how long the contents last. The Pure Source Vein Stop product has a guarantee for one whole year. Well, that is impressive. They do require however, that while returning it, you should include a short explanation as to why you are returning it. Pure Source Vein Stop is quite the product. it offers a whole year guarantee and gives good direction on how to use the product. But it is concerning to note that there are all these ingredients in it that have chemical names and yet, not one side effect is listed.